Telling the tale of a “mostly true story”, Alan Bennett (Jennings) is a successful, albeit mildly self-torturing playwright who slowly forms a reluctant friendship with Mary Shepard (Maggie Smith), a stubborn and deluded homeless woman with a reputation around the neighbourhood. Spanning several years, the film is based on the play of the same name by Alan Bennett and is directed by a previous screen director of Bennett’s work. There seems to be an automatic guarantee with anything written by Alan Bennett, as his name is now an institution. Interestingly, this kind of story is something that requires perhaps some pre-knowledge of Bennett’s success, to be fully appreciated. The film is not at all smug or esoteric but there is a sense of comfort in its story telling. The writing doesn’t fail, naturally, but there is something lost in the direction. The majority of the film relies on dialogue and performance but whenever we take leave from this, and the film uses visual storytelling and atmosphere, the narrative feels somewhat adrift. The information for the turning points in the story are provided but audiences might find themselves taking a moment to completely understand where they are. This isn’t helped by the fact that the story spans about fifteen years and does so rather casually. It also gives away some of its reveals ahead of time. All this culminates in a loss of emotional depth and commentary that the film could have had, the kind that The History Boys provided in spades (also written by Bennett and directed by Hytner). The film is a little tonally confused at times too, although it is never too jarring. These missing pieces aside, The Lady in the Van is still a lovely movie. Its tale is worth telling and is told very well. The structure suffers but the dialogue holds it together, providing excellent introspection on Bennett and his rather engaging surrounding characters. There’s a lovely cast of familiar British faces, not to mention various cameos of History Boys cast members and other Bennett productions. However, it really needs to be mentioned just how terrific the film’s two leads are. It’s clichéd to say but Alex Jennings and Maggie Smith disappear into their roles. Alex Jennings creates a loving and self-effacing portrait of Alan Bennett. His Bennett at times has literal conversations with himself in an existential dual performance which is both lovingly surreal and also feels very natural. As excellent as Jennings is, he is still outshone by Maggie Smith. She gives a performance that is tragic, brutally honest and yet still amusing, entertaining, and without any sense of ridicule or comedic exploitation. 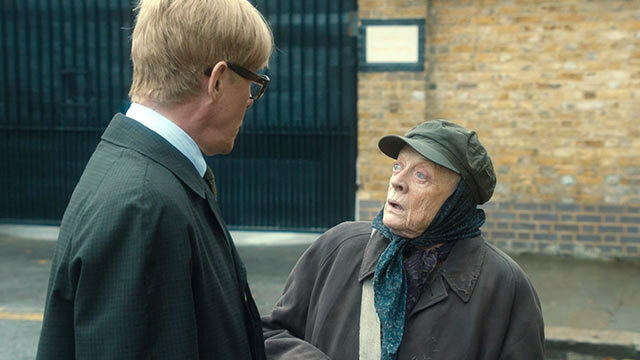 Maggie Smith assures that the film is successful in providing an honest tribute to a curious real life character from Bennett’s life. In that honesty, the film factors in that the story is through Bennett’s perspective, making the self-examination and introspection of his character necessary. Because of this, the heart of the film is very strong. Its execution is similar to something like the story telling and examination in Adaptation, with which it shares some DNA. In saying that, it’s possible that this issue of the story telling feeling adrift is due to a refusal to abide by conventional structure. However, the film still doesn’t have the same emotional depth and commentary that Adaptation provided so strongly. As a result The Lady in the Van feels much milder, though still very enlightening and enriching. In the end, The Lady in The Van has potential to have been a stronger movie but it is still a lovely film. Thoroughly enjoyable and amusing, it still contains firm elements of tragedy and a solid cast. At times adrift, but still effective and relaxing. At the risk of using a Briticism, this is one delightfully amusing drama.